Food waste in America is a major epidemic. Did you know that 40% of the produce grown in America is simply thrown away or left to rot because it doesn’t meet consumer standards of how it should look? It’s not just restaurants or grocery stores, either. Waste in the home is significant as well. American homes lose approximately $1,600 a year to food that goes uneaten. We’re all guilty of it. We see a certain fruit or vegetable on sale at the grocery store and stock up. For example, with pricey seasonal fruits like strawberries and cherries, we think it’ll make a nice healthy snack for the kids. Only the kids don’t eat it–and mom and dad don’t want it either. Being able to preserve food for longer is just one of the many benefits of dehydrated foods. Read on to learn about why you need to jump on this food trend. 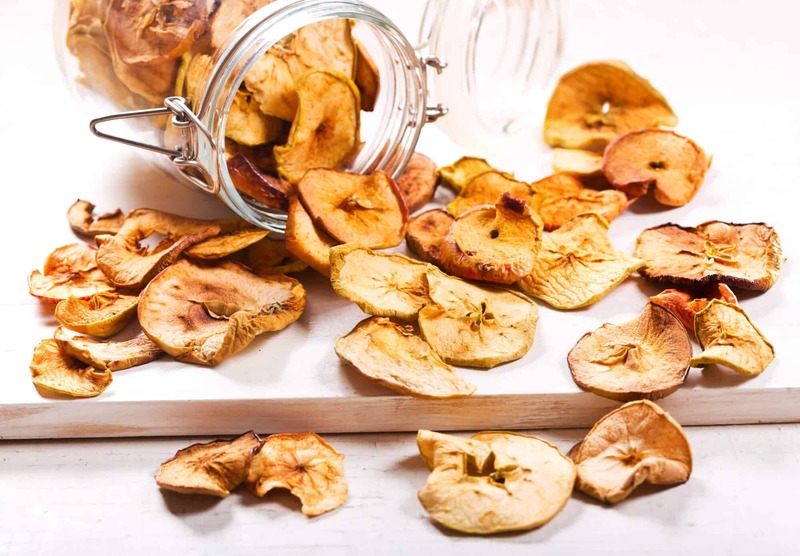 If you’re just starting out with dehydrated foods, you may not want to purchase a food dehydrator just yet. By setting it at a low temperature, you can use your oven to slowly dehydrate some food items. You’ll soon find that you’re ready to invest in a dedicated appliance. Food dehydrators offer a lot of benefits. Most importantly, they are more effective at removing moisture and will give a significantly longer shelf life for your dehydrated foods. One of the reasons this trend has caught on is the fact that we’ve become much more aware of how we’re impacting the planet. If you have a food dehydrator, you can limit the amount of food your family is wasting by dehydrating anything on verge of going bad. When properly stored, dehydrated food can last up to a year in your pantry. Instead of throwing out forgotten food, you have a way of making it last longer. Besides being eco-friendly, another great benefit of dehydrating food is all the money you’ll save. Like we mentioned earlier, food waste costs a family of four in America $1,600 a year. We’re sure there are much more exciting things you’d rather be doing with that money! But dehydrating foods offer other cost benefits as well. Fewer trips to the grocery store means less money spent on gas and impulse buys. You can also make your own gourmet foods like fruit leathers and sun-dried tomatoes for a fraction of the price. Another bonus? You can take advantage of buying fruit when it’s in season and dehydrate it so that you can enjoy it any time of the year. Dehydrated foods are healthier than their counterparts. Unlike regular cooking, food that has been dehydrated retains the majority of the mineral and vitamins they had when they were raw. Some fruits, such as cranberries and grapes, are actually healthier after being dehydrated. The process packs them with twice the level of antioxidants compared to before. Delicious and nutritious–it’s a win-win scenario! Manufactured dried goods like beef jerky and veggie chips are full of chemicals and preservatives. These chemicals are necessary for food to retain quality during the time it takes to go from being harvested through manufacturing and to your kitchen counter. But when you dehydrate food at home, it contains only the ingredients you’ve put in the dehydrator. No more worries about ingesting chemicals with unknown long-term effects! We keep talking about how much we love this food trend because it’s environmentally-friendly and cost-effective. Those benefits trickle all the way down to storage. Since dehydrated foods don’t need to be refrigerated, this cuts down on your electricity costs and carbon footprint. Think about the size of a raisin compared to a grape. Now imagine that same comparison for a mango or zucchini. Finding space for storage in your pantry becomes much easier when everything has been shrunk down in size! Before you start dehydrating food, stock up on some glass jars with tight-fitting lids or small portion, vacuum-seal ziplock bags. Make sure these containers are insect-proof too. Before we started dehydrating foods, I shudder to think about the snacks we’d grab for the kids on the way out the door. Since we hadn’t prepared anything in advance, we’d grab a handful of processed sugary snacks, like pre-packaged brownies and trail mix. Just like when you’re at home, eating healthy doesn’t need to be difficult. It just requires some advance planning. Since dehydrated foods can be stored in small and efficient containers, you can easily take these on the go. This is true whether you’re running out the door to school or planning a road trip across the country. The sky’s the limit when it comes to what you can put in your dehydrator. Your friends and family will love being a guinea pig to all your experiments when the results are so tasty and nutritious. Besides foods though, you can make really beautiful household products with your dehydrator. You can even make your own dried herbs, teas, and potpourri. Anything your imagination can think of, you can make with a food dehydrator! With all these benefits, it’s no wonder that dehydrated foods have become so popular in recent years. Ready to jump on the bandwagon, but not sure how to get started? 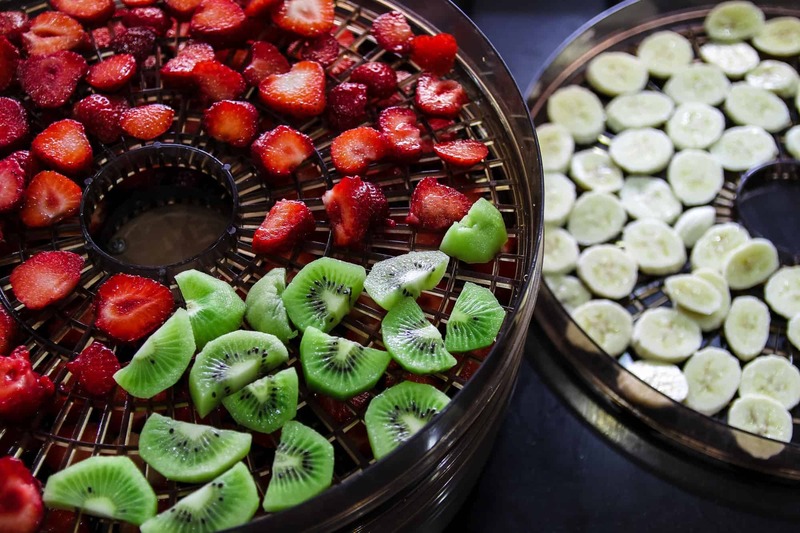 Visit us and read about some of the best dehydrators on the market. We’ve got one that’s perfect for you and your family. Air Fryer or Food Dehydrator: How Different Are They?